*** NOTE: There will be an OPTIONAL pre-seminar WORKSHOP on Friday, March 15, from 2:00-5:30 pm (3 contact hours) for an additional $99*, with LESLI BELL, DPT, CLT-LANA: "Treating Breast & Truncal Lymphedema"
(*You may attend this Workshop & the Reception without attending the full seminar for $129. 7:30 a.m. through 6:00 p.m. Call for Reservations and ask for the discounted Lymph Seminar rate of only $89/night! This hotel is 3.6 miles from the hospital and .5 miles from the Seattle International Airport (SeaTac). They have a FREE Airport Shuttle. 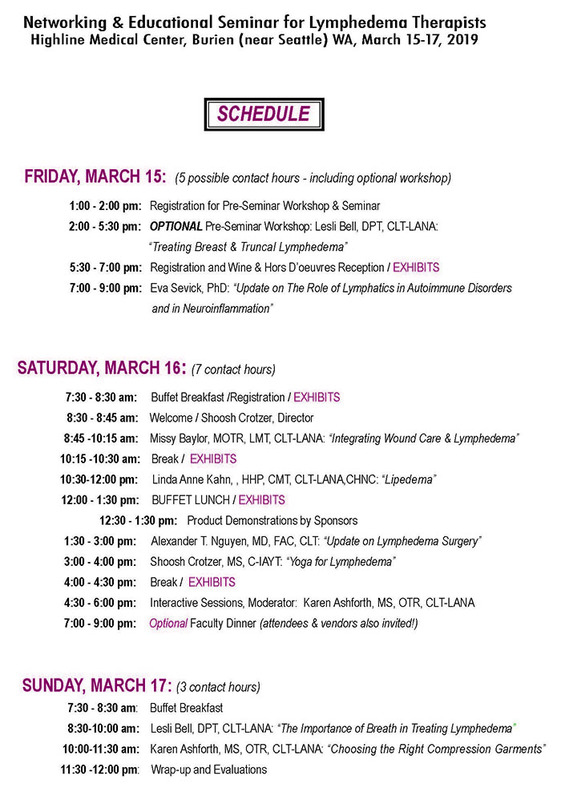 Lesli Bell, DPT, CLT-LANA: "Treating Breast & Truncal Lymphedema" (Optional Workshop) and "The Importance of Breath in Treating Lymphedema"
Eva Sevick, PhD: "Update on the Role of Lymphatics in Autoimmune Disorders and in Neuroinflammation"
Missy Baylor, MOTR, LMT, CLT-LANA: "Integrating Wound Care & Lymphedema"
Linda Anne Kahn, HHP, CMT, CLT-LANA, CHNC: "Lipedema"
Alexander T. Nguyen, MD, FAC, CLT: "Update on Lymphedema Surgery"
Shoosh Lettick Crotzer, MS: "Yoga & Lymphedema"
Karen Ashforth, MS, OTR, CHT, CLT-LANA: "Choosing the Right Compression Garments" and Moderator for Interactive Sessions"
Lymphedema Seminars is an Approved Provider #8208 for Continuing Education by the American Occupational Therapy Association (AOTA). We provide Certificates of Completion to all attendees. PLEASE TELL US OF YOUR SPECIAL NEEDS: When filling out your application, please inform us of any special needs you might have, either physical, sensory or cognitive. We are fully committed to accommodating the special needs of participants and will do everything possible for requests received two weeks before the seminar. Special needs and dietary requests can be emailed to info@lymphseminars.com. If you are unable to attend a seminar that you have paid for, our preference is to offer credit towards a future seminar valid for one year. If this is not possible, we will refund the entire amount of payment if a written request is sent more than 14 days prior to the seminar, or if there is a valid medical reason for not being able to attend. If a seminar is cancelled by Lymphedema Seminars for any reason, we will provide a full credit for a future seminar valid for one year. Lymphedema Seminars will not be responsible for non-refundable airfare or other incurred costs for arriving to the course, and will make every effort to contact attendees in a timely fashion if a course has to be canceled. If there are any complaints, please send them to us in writing and we will respond within 7 days.